Tonight, it's the second inning, a bit on the chilly side of mild. It will cool further as the night goes on. In the first inning, Elvis Andrus, Josh Hamilton and Michael Young combine for a walk and two doubles to give the Rangers a 2-0 lead off St. Louis starter and current ace Chris Carpenter. Freese is in the unlikely position of batting behind Albert Pujols and Lance Berkman—respectively the greatest right-handed and switch-hitting batters of their generation. With Ryan Theriot and Allen Craig already retired, Rangers' starter Matt Harrison won't pitch to either if he has somewhere to put them. Between the two, Berkman is the only one who sees a strike, and even that's a 3-0 gift. Harrison probably feels pretty good passing over a guy slugging over .600 for his career and a guy slugging over .540 for his career to face a solid but not spectacular hitter who didn't OPS .800 this year. He only needs one out. Given Pujols, Berkman and Freese, Harrison and Texas manager Ron Washington have chosen to try to get it from Freese. They know how otherworldly he's been this October, but the Rangers aren't going to gameplan around a guy with only two decent half-seasons at the plate. Neither Harrison nor Washington would articulate it this way, but in time all luck fades, all underdogs falter, all outliers normalize. In short: no way he does it again. Freese takes the count full, then rips a fastball into the gap. Two runs score. Tie game. Later that night, David Freese is intentionally walked for the first time since he played for the AAA Memphis Redbirds in the Pacific Coast League. The sound you hear as he takes first is Washington finally shutting the barn door. There is a healthy internal struggle in baseball writing between narrative and statistical fact. There should be. Sports are as ripe a subject for storytelling as politics, warfare or any other long-running conflict, and fine stories can be told not only about baseball, but about hockey, basketball and both kinds of football. But baseball differs from other popular American team sports in one very specific way: in baseball, just about every conflict is an easily delineated transaction between two individuals. This means that is much simpler to statistically analyze with confidence; there are fewer moving parts. It's either a pitcher and a batter, a fielder and a runner, or a fielder and the ball. There are no linemates, Tampa 2 defenses, or intentional fouling to consider. There's not even a real clock. Baseball's default time limit is that you have been given 27 outs, and you are expected to use them wisely. It's not that individual achievements don't matter in the other team sports—quite the opposite, in fact. No one would ever seriously claim it was the guys around him that made Bobby Orr great. It is, however, harder to analyze those sports with hard data. Principled statistical thinking in football, hockey and basketball is in its comparative infancy when put alongside the work of Bill James, Tom Tango, Nate Silver, Keith Woolner and others. Advanced football statistics are perhaps the most useful, and they have yet to influence team decision-making in the way sabermetrics have. That's why there's an ongoing conceptual war in baseball—not because advanced stats exist, but they have gained prominence. Because teams now use them to make decisions about baseball operations. Because Hollywood makes movies about their more handsome proponents. The war is a farce, of course. Most statheads don't really dislike a good story any more than traditional baseball men really dislike guys who get on base. This is a fight that exists in the margins of performance: no one denies that Kirk Gibson is a baseball hero or that by the numbers, Barry Bonds is one of the best pure hitters of all time. Considered rationally, it's not a fight at all. It's a situation that requires the simple recognition that sometimes narratives are misleading, and sometimes stats are boring. And when it comes to Major League Baseball, an expensive, high-stakes leisure activity that's supposed to be enjoyable for its fans, these are both very real flaws. 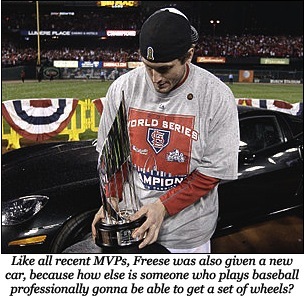 Freese's postseason transcends this divide; it is beautiful in all facets and from all perspectives. 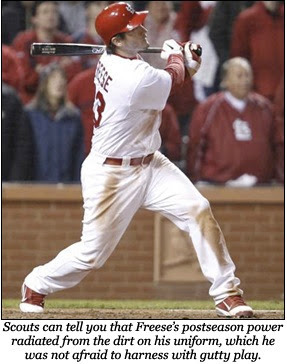 The statistical: David Freese steps to the plate 71 times in the 2011 NLDS, NLCS, and World Series. Seven of those times he walks (not counting the intentional pass at the end of Game 7); 14 times he strikes out. That's exactly a 2:1 strikeout-to-walk ratio. In career MLB regular season play, he's got 141 Ks to 47 BBs—exactly a 3:1 strikeout to walk ratio. Either he's seeing the ball better, or the home plate umpires are calling a zone that favors him or, heck, maybe he just gets lucky and foul tips a few balls he'd otherwise swing right through. But it's likely that first one; Freese seems to be seeing the ball pretty damn well. Not only is he walking at a better clip, but he's making better contact. There are a lot of factors that go into whether a ball put in play becomes a base hit, but, as a rule of thumb, seven of ten times a batter hits a line drive he ends up on base somewhere. Over the course of Freese's career, a hair under 23% of the pitches he puts into play are line drives. In the 2011 postseason, that jumps to just under 33%. That means he's hitting less of something else: groundballs. Over his career, about half the balls puts into play are grounders. About eight of ten times, those are outs. In this postseason, Freese goes from 50% groundballs to 36.7%. The final third or so are flyballs, and this is where Freese does damage in chunks. First, he doesn't have a single infield flyball the entire postseason. That's not too surprising; while about 10% of the league's flyballs are infield popups over the last few years, Freese's infield-flyball rate has never been over 2.4%. This makes some amount of intuitive sense combined with his career groundball rate, which is 6% or so above league average. Second, and more important, one third of the flyballs Freese hits this postseason become home runs. Thirty-three percent. He hits 15 flyballs, and 5 of them leave the park. It goes without saying that this is not a normal distribution; league average is somewhere around 10%. His own percentage is up this year, though not quite that ridiculous; 16.7% of his flyballs in the 2011 regular season left the park. His slash line gets the boost one would expect from this sort of power surge: .794 SLG in the postseason against .429 for his career. He almost hits .400 in these 71 PAs, helped a bit by a .455 batting average on balls he puts in play (BABIP), but when your power and line drive percentage spike the way his do, that's not all that shocking. Statistically, he ends up with a .397/.465/.794 line, good for a 1.258 OPS. Those are MVP numbers. Side note: In 2004, Barry Bonds hit .362/.609/.812... for the season. On average, 1 of every 4 flyballs he hit in his career was a homerun. Barry Bonds has an extremely strong case for greatest player of all time—but that's another column. When Matt Harrison walks Pujols and Berkman to get to Freese, he's doing it because those two guys are going to the Hall of Fame when they retire, and who the hell is David Freese, anyway? Glad you asked, Matt. He's the high school star who almost walked away from the game after he graduated; a guy who messed up both his ankles in a car crash and has metal plates in one hand (thanks, Scott Linebrink); a young man who the Padres traded for the faded glory of Jim Edmonds, one of the best and most beloved Cardinals of the past three decades. He's just a kid from St. Louis who loves the Cardinals, and there is literally nothing more perfect or right in sports than a team roaring back with his foot flooring the pedal. When he does it by bailing his team out in the shadow of elimination not once, not twice, but three times in 48 hours, you make him the World Series MVP. Chris Carpenter was great for the St. Louis Cardinals this October. David Freese was legendary. But for every triumph, a tragedy: Nelson Cruz looks at David Freese and sees what might have been. Because by all rights, the legend of David Freese should have ended with Game 6, when Freese stepped to the plate in the ninth, with two on and two out, and took a two-strike pitch to right field. Deep right field, yes—but playable. Still in the park. But Cruz—and if this doesn't haunt him until the end of his days he is a mentally stronger man than I—Cruz breaks in on it. He realizes his mistake and begins to retreat, but he's three steps too late. 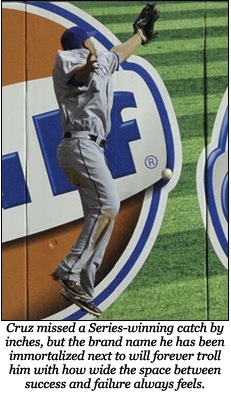 The ball goes over his glove and off the wall. Instead of the first World Series win in Texas Ranger franchise history, it's a triple and a tied game. And none of it even happens if the Atlanta Braves don't go to pieces in the last few weeks of the season. If they win one more game, maybe it's the Braves playing instead. Maybe Dan Uggla is MVP—who knows? Crazier things have happened. It has been an amazing two months of baseball, regardless of who you root for, how you approach the game, or what your interest level in baseball is. It's been as good for the casual fans as it has been for those of us who think about it so much that it feels somewhat unsettling when it's over, and we start searching for pirated feeds of the NPB playoffs. It's over a hundred days until pitchers and catchers report, and though we trust that Albert Pujols and Yu Darvish will keep our attention, it's not the same. Eventually, though, it will be spring again. The rain will stop freezing; prospects will get overhyped or overpanned based on a dozen or so meaningless exhibition games; pitchers will start hurting their elbows; I will have fever dreams of the Orioles finishing third in the AL East, and Vernon Wells will still be making over $20 million a year. The campaign will begin anew. With the 2012 season, Cardinals fans will see a new David Freese, likely similar in profile to the guy from the last couple years but with a lot more bobbleheads and t-shirt nights. Maybe his ankle(s) will explode. Maybe the opposite-field power he flashed in 2011 was for real. Whatever happens, it's a fresh start, not only for him but all of baseball. And that's the final beauty of David Freese's October: It's over. He won.